We're all probably guilty of it at some point. We're looking at our phones and we get so engrossed with what's on the screen that we forget the world around us. What we may not all be guilty of though, but that many people still do, is looking at phones while walking on the street, and even worse, while crossing the street. That "zombie" behavior not only endangers the pedestrian doing it, but also the incoming drivers, other pedestrians, and everyone on the road. Dutch town Bodegraven is starting a trial for a new traffic light that wants to solve that issue by providing more visual feedback for smartphone users in an angle that makes sense to them: down on the floor. Since every zombie pedestrian has their face most likely tilted down to check their screen, they should spot the illuminated strip of light on the floor that tells them they're about to cross the road and also lets them know whether they can do that or they have to wait until the light turns green. 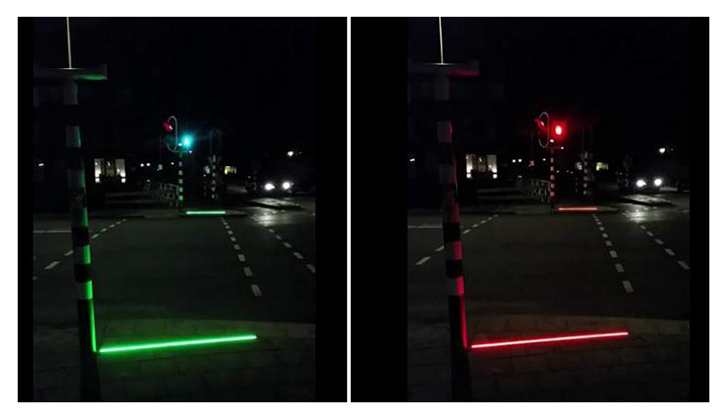 The system is called +Lichtlijn and hooks into the traffic light and synchronizes with it. It's been built by HIG Traffic Systems and has only been installed at one intersection in Bodegraven, at Goudseweg / Vrije Nesse to test it out. However, the Dutch road safety lobby group VVN is not happy about it, saying it rewards bad behavior. But the town officials have a different outlook and seem more realistic than idealistic. Their thinking is that the trend is already established and difficult to reverse, so anticipating problems and trying to avoid them is a good way to solve the zombie pedestrian problem.